﻿ Bein Wine: just Merlot! Ingrid will tell you that it's because of her beloved PETRUS, named after the stellar example of a fine Merlot from the famous Chateau Petrus in Pomerol. However, her Petrus was a retired race horse, which she bought for the butcher's price and nurtured back to track. He won a few good races, contributing to the purchase of our wine farm. If you ask us why Merlot, you might get different stories, depending on whether you ask Ingrid, or Luca, or even the soil expert from Stellenbosch University, who did the initial site analysis and actually recommended Merlot. But whatever the reasons, our vineyard is definitely suited for Merlot, with its cool south-facing slope, the deep well-drained soils and the proximity to the sea. Because these factors are so important for Merlot, they are also important for us. As Merlot fundis, we aim to convey the terroir as purely as possible. Judging by its popularity, one would think that Merlot is an easy grape to grow - but it's not. Viticulturists agree that the very site- and climate-sensitive Merlot should be considered the most challenging red grape in South African vineyards. And it's a difficult variety in the cellar, too, which every winemaker will gladly confirm. This is the reason why we spend so much energy in fine-tuning our production. Have a look at our vineyard page and see our approach of optimizing quality. See how we produce four distinctly different wines from one single vineyard, and still adhere to our terroir principles. Or even better, come and visit us and get a taste of our wines! When the fruit is ripe, the different microsites defined by Precision Viticulture are harvested separately. The crop is handpicked and carefully sorted already in the vineyard, removing any substandard berries right there. This guarantees that only the best fruit makes it to the cellar. There, the fruit is double-checked on a sorting table, then destemmed and slightly crushed, and finally fermented in stainless steel fermenters. Malolactic fermentation and further maturation of our red wines takes place in small 225L oak barrels sourced from top French cooperages. After one year of barrel maturation, the different batches are carefully evaluated, followed by tedious series of blind tastings. 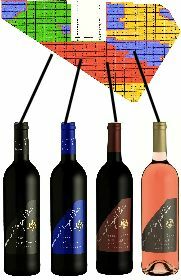 The optimal combination eventually makes up our flagship wine Bein Merlot.